Hull painting scheme of SSBN-643 USS George Bancroft? I'm building a model kit for my dad for Christmas of the boat he served on in the Navy. The kit is actually for the lead sub in the class, but it contains decals for the others. The instructions have four different paint scheme suggestions, with slight differences, and I'm not sure which one to use. Google Image Search for SSBN-643 has been less than helpful. It's given me black & white images, color images that have faded with age, images where most of the sub is below the waterline and you can't see how the hull is painted, and images of where the Navy chopped the sail off of it during decommissioning and put it on a concrete monument making it look like the boat is surfacing out of the lawn next to a Naval Base Gate. It's also turned up images of products sold by professional modeling companies for hundreds of dollars that have the whole thing painted in black, unlike the model instructions that have the lower half in red, and in some instances, upper portions in battleship gray. Can anyone recommend to me another resource to check online, or perhaps someone has access to an illustrated naval history book they could look this up in? If it matters, I'm particularly interested in the original paint scheme that it would have had at the time of commissioning, as that's when my dad served on her crew. Here is an explanation of why there are different colors. Heres some discussion that says the two-tone paint is correct for when the sub is commissioned. The previous sub in the class, Kamehameha, can be seen in various photos here, including one in colour just after launch clearly showing the red lower portion scheme. If you then compare the Kamehameha before launch in this photo with the George Bancroft in this poorer quality one just after launch, the black and white tone differences at the prow look like a pretty exact match, spatially, for the transition from dark to red. 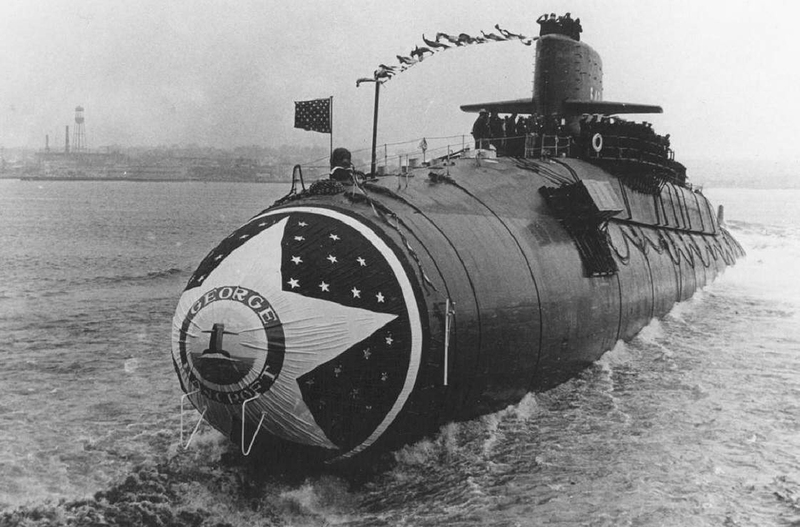 The two subs were launched within months of each other, though they were built in different shipyards. Annoyingly it seems all the photos of subs in that class from the same yard as SSBN-643 are black and white. Looking closer at the instructions, even though they have 4 different diagrams, I can't find any substantial differences between the diagrams for SSBN-640, and SSBN-645. Since my dad's boat was built between these two, I'm confident that this is the one I should be using. The Kamehaheha also fell into this window, and was built by the same company, if not at the same shipyard, so the color photos of it are handy. At first, I had dismissed using them as a reference, as some of them had the anti fouling red much higher than centerline, which was different than what any of my diagrams show, but one of the posts in the threads ArgentCorvid linked to explained that they start out with the red going up to the waterline pre-commissioning, and are repainted when they're approved to go out on patrol. Since my dad continued to serve on the boat after commissioning, I'll be able to just follow the diagrams for 640/645.